Vintage From Paul is delighted to offer this mint Condition, Early 1900's Ruby Stained Miniature Mug Shot Glass. This very nice little miniature mug has a ruby stained upper body with a clear handle and base. The base is a simple pattern of thumbprints. These ruby stained miniature mugs were often used as promotional items at Circus' and other notable events. Sometimes they were used as a promotional item for various cities. Normally they have the name or the city acid etches on the ruby body. This piece is unique in that there is no such detaioling to indicate the city or event. There are no chips or cracks and the ruby stain is very nicely preserved. 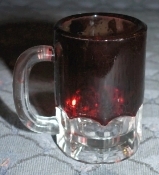 The Early 1900's Ruby Stained Miniature Mug Shot Glass stands 1-7/8 inches high and measures 1-1/4 inches in diameter. This is a very nice example of antique ruby stained glass.